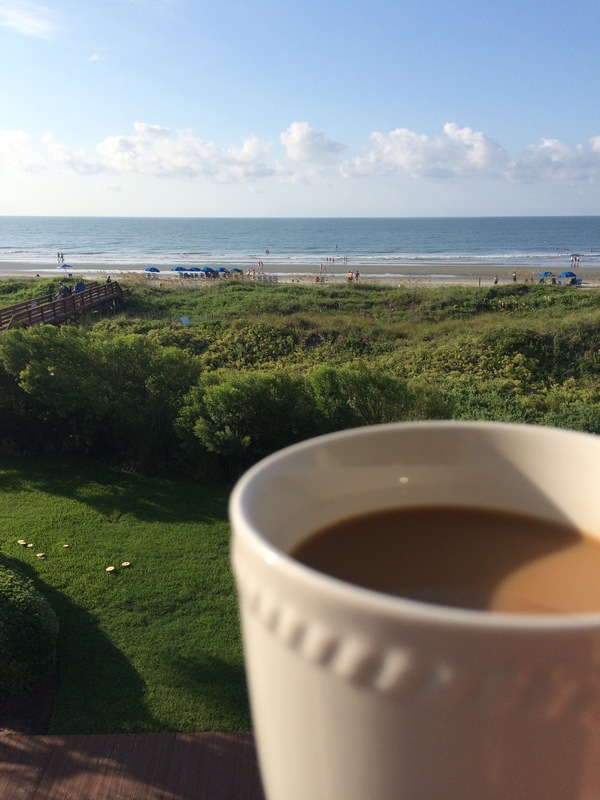 My morning coffee with the shore of the South Carolina coast. We have imparted our excitement of this area to our daughter, Dana. She has a natural attraction for all things beach. But she ,as well, is drawn to Charleston and its southern charm and hospitality. To get everyone to switch gears we listened to Pat Conroy’s, South of Broad, on the drive. Both Charlie and Dana bit the hook and are enjoying the book. Charlie and I have read most of Conroy’s books….Hmmm, I even devoured his cookbook which I need to dig out when we return! We look forward to our week here in this beautiful area to rekindle the magic of the low country! And yes, I brought a basket of hand sewing projects for the porch overlooking the ocean!